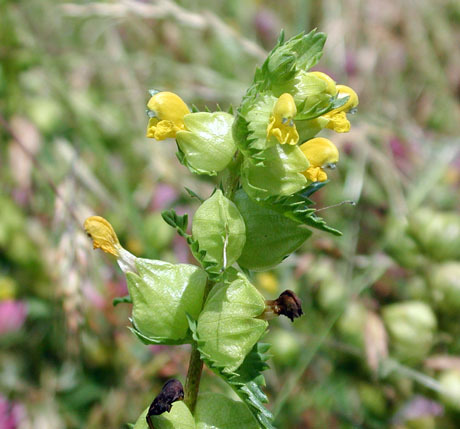 Yellow rattle is an annual most often found in old meadows and pastures on well-drained limey soil. It varies in height up to perhaps two feet. On stiff stems, the narrow leaves are toothed and borne in opposite pairs. The flowers, from May to July, are yellow, two lipped and in loose spikes. The inflated seed containers (calyxes) are purse-shaped and, when ripe, the flat, winged seeds rattle inside, hence the plant’s name. Other local names include hen pen, penny grass and pots and pans. This plant is semi-parisitic; it fixes its roots on adjacent grasses and, by taking minerals and water from them, it weakens the grasses. 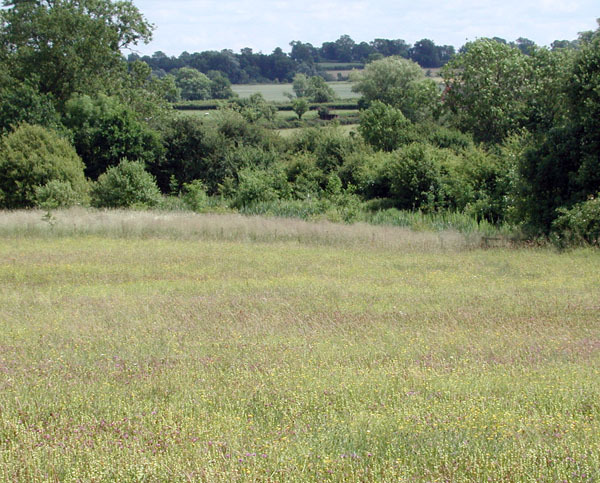 For this reason, it is often included in wild-flower-meadow seed mixer, to reduce competition for other (presumably more desirable) plants. In Sulgrave it may be seen in the churchyard, in the Pocket Park and is abundant in the meadows bordering the footpath to Barrow Hill. This entry was posted on Tuesday, June 29th, 2010 at 4:27 pm	and is filed under News. You can follow any responses to this entry through the RSS 2.0 feed. You can leave a response, or trackback from your own site.